Arborvitae is overwhelmingly used for screening. 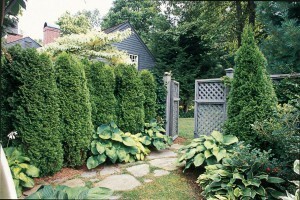 When planted en masse, the arborvitae reins king of the budget-friendly “green” fence option. But that doesn’t have to be its only function. 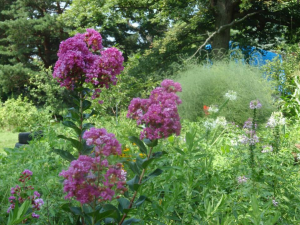 Why not a single vertical element in a border or perennial bed? 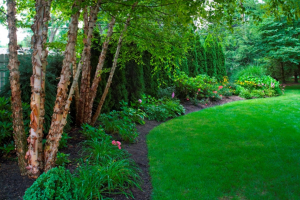 If you have the space to allow for it, Arborvitae Techny or ‘Nigra’, which grow to be about 5’ wide and 18’ tall, have a great deep green color and a more attractive texture than some other varieties. 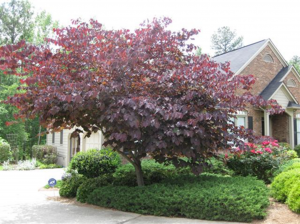 Another thought on good old arbs….Globe Arborvitaes. As the name implies, they are naturally globous in shape, giving value to the term low-maintenance – no sheering required. And for those who love the manicured look with less effort, I say go all in. Don’t be afraid to give your garden some balls. And why not lots of them! 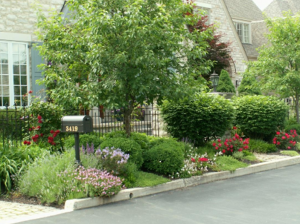 There’s no arguing that the manicured garden style makes a bold statement. Another creative wa y to achieve this look is with the Rose of Sharon. Typically desired for its repeat showy summer blooms, it can grow to be rather large naturally but can also tolerate sheering. More memorable, however, is seeing it pruned into a topiary, as a specimen at The Biltmore Estate left an impression on me years ago. Vegetable and herb gardens are also typically grown in formal design beds or at least allotted a separate spot from the rest of the landscape. But why? There are so many beautiful varieties of food, why not grow them throughout your yard? Take companion planting to a whole new level when you have edibles mixed in your mixed borders! 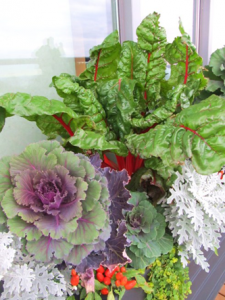 Or if that sounds too daring, try some ruffled kale or rainbow chard in your annual pot displays. Same idea, just on a smaller more manageable scale. Speaking of daring, let’s talk about roses for a moment. There are so many colors and varieties available now, mostly all disease- and pest-resistant to boot, it would be a challenge not to get creative with them. If you have a sunny foundation in need of some pop, I’d suggest a row or mass planting of roses with a small evergreen hedge (read: boxwood) in front. The boxwoods would hide any inevitable naked leg syndrome and provide an evergreen backbone during the winter. 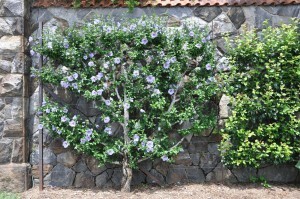 Depending on the variety, you could potentially have a consistent blooming foundation from late spring into early fall. Not everybody has that! My last thought I’ll leave you with is with ornamental grasses. Typically used in threes to soften a corner or edge. Standard curb appeal. But when these guys get together en masse and with a couple different varieties thrown in, something magical happens. Yes, in early spring, everything will get cut back- but grasses will start to green up quickly and by the time June has arrived, the buzz cut will have completely grown out. The grasses will be full with varied heights and subtle color variations, and the bigger the mass, the bigger the impact, all year long. I’m using a few smaller varieties to frame in a wildflower patch in my front yard. Yup- front yard, folks. That has me thinking, maybe I should flank it with some globe arborvitaes….. 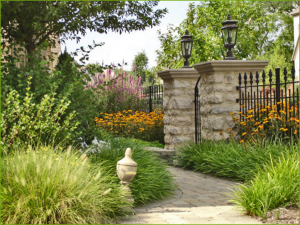 This entry was posted in Design, Gardening, Landscape, perennials, trees and tagged gardening, grasses, landscape, Oakland Nursery, perennials, Plants, Trees. Bookmark the permalink.